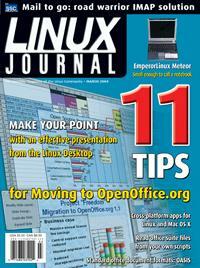 Make a professional case for your next Linux project. Switching office suites is easier than it looks. Use this XML-based tool to build the same software on Linux and Mac OS X.
Lock-in is so 20th-century. A common file format lets apps compete on features and ease of use. The standard Linux music player has some little-known but powerful features. XML and Ruby let your scripts and your office suite handle the same files. Get an interface working quickly with the old-school tool for rapid app development. Show off a giant view of your next vacation spot with some careful shooting and this powerful photo tool. Use effective tips to teach users your application without annoying them. Get the reliability of server-side mail with the speed of local folders. How the kernel makes your laptop battery outlast your next flight.